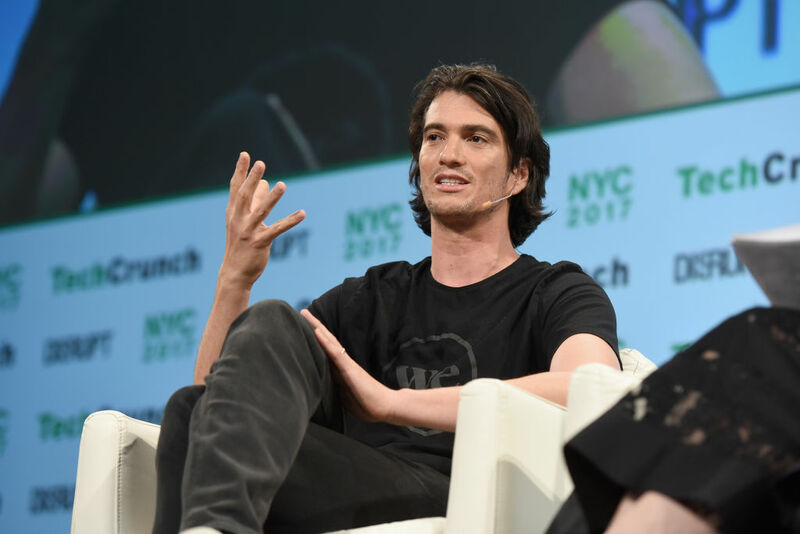 WeWork co-founder Adam Neumann is up to something. The company he co-founded in 2010 with Miguel McKelvey is currently valued at $47 billion, thanks to a recent investment from Softbank. Neumann himself has a $4.5 billion paper net worth thanks to his 10% stake in the company. Neumann moved to the U.S. from Israel in 2001 after a stint as an officer in the Israeli army. He co-founded the co-working office company after selling GreenDesk, an eco-friendly co-working space in Brooklyn. Recently though Neumann has been engaging in some sort of back room dealings that leave us scratching our heads. Just what is he up to? Neumann has been selling hundreds of millions of dollars worth of stock over the course of recent outside investments in WeWork. There's nothing wrong with this. He's been using the money to buy ownership stakes in office buildings. Again. Not wrong. In fact, a good investment. It's what comes next that feels a bit shady and unethical. Neumann then leases the spaces he owns back to WeWork. So, he effectively profits on both the rent WeWork pays to him and the rent clients of WeWork pay to the company. Hmmm. It's not just us who think this is a conflict of interest. The Wall Street Journal reported that multiple investors in the company said that Neumann's arrangement concerned them. They see it as a conflict of interest. WeWork signs long-term leases for office space with landlords and then subleases them out on a short term basis to companies. Neumann, 39, is the company's largest individual shareholder and as such, has voting control over the company. Before he secured voting control, Neumann attempted to buy a 5% stake in a downtown Chicago office building in 2013. The board of WeWork vetoed it over a potential conflict of interest. The 5% stake was instead bought by WeWork, rather than Neumann individually. In 2014, Neumann gained control of the company and was granted Class B shares that gave him 10 votes per share. This gives him more than 65% of the overall share vote, according to corporate filings by WeWork. Since this time, Neumann has bought several properties and leased a number of them to WeWork. WeWork states in a prospectus last year that it had leases with multiple properties owned at least in part by Neumann. The company also said that WeWork paid more than $12 million in rent to buildings that were partially owned by officers of the company between 2016 and 2017. Future payments on leases of this time total more than $110 million over the life of the leases. Neumann owns a number of stakes in office space in San Jose. He is the main investor in a group that has been buying multiple properties in downtown San Jose over the past 18 months. His plan appears to be to amass a portfolio of buildings that would create an urban campus of sorts full of WeWork offices including a residential building called WeLive. Corporate governance experts familiar with this case said that Neumann's ownership of buildings he leases back to his own company is quite unusual for a large company. Usually, the corporation bans executives from these types of arrangements. Is what Neumann doing illegal? No. Is it shady, unethical, fishy, and conflicted? Most definitely. He is collecting millions of dollars of rent from the company he founded and is CEO of. Can You Guess The 7 Most Valuable U.S. Startups? These seven so-called "decacorns" are all valued at more than $10 billion. Obviously, we cover a lot of technology billionaires here at Celebrity Net Worth. We all know Bill Gates, Elon Musk, Mark Zuckerberg, and Jeff Bezos. But have you heard of Lucy Peng or Brian Acton or Rishi Shah?